Finance Minister Bill Morneau will deliver his fall economic statement this afternoon. As I was writing this, all indications were that the federal government would wisely sidestep a corporate tax cut war with the United States, much to the chagrin of rich investors in Canada. And let’s be honest. Canada’s long running (and very expensive) experiment in corporate tax rates–to see if lowering them to compete with U.S. levels leads to extra investment in the economy–was more or less a failure. Companies used the differential to enrich themselves and their shareholders. Just look at these three charts. Source: OECD, 36-10-0104-01 and author’s calculations. 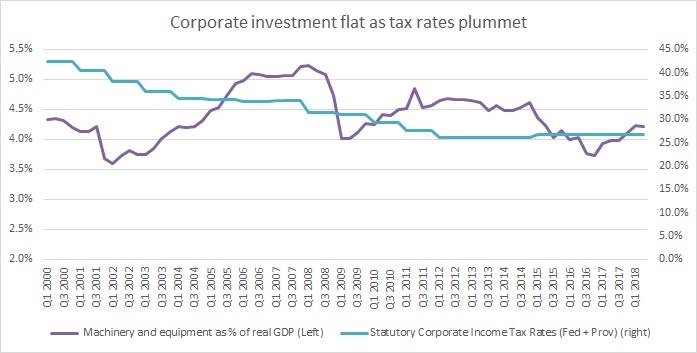 The combined headline corporate tax rate fell from 42% in 2000 to 27% in 2018 (this includes both federal and provincial corporate income taxes). Most of that decline happened federally, where the rate fell from 28% in 2000 to 15% today. What happened to corporate investment in machinery and investment in that period? After dropping at first, investment picked up in line with the economy, fell again after 2008, and is today at about the same rate as in 2000, before the cuts were initiated. Source: OECD, 36-10-0117-01, 10-10-0153-01, 36-10-0104-01 and author’s calculations. Since 2000, payments to shareholders, through dividends or share buybacks, have doubled as a share of GDP, and in dollar terms have risen from $76 billion to $281 billion a year. 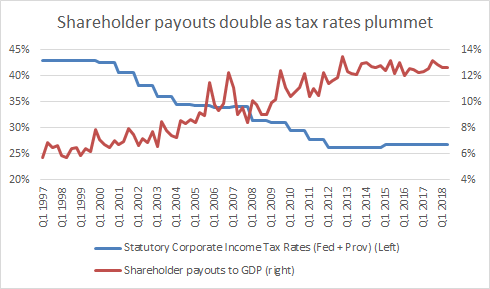 The proceeds from lower corporate tax cuts have gone to rich shareholders and owners first, as predicted during pre-cut debates. Source: OECD, 36-10-0104-01, 36-10-0580-01 and author’s calculations. One of the unexpected results of more money staying with corporations (versus government) is that instead of investing that money, they just let it sit in their bank accounts. This suggests to me these corporations have no idea what to do with the extra money when they do convince governments to cut their taxes. What these three graphs tell us is that there are much better uses for federal money than more corporate tax cuts. How about accentuating one of the massive differences in costs between Canada and the U.S., namely health insurance? In the U.S., companies have to pay for private health insurance; in Canada, governments pick up almost all of the tab. A national pharmacare plan would further save the corporate sector billions in private drug insurance premiums and make Canada even more competitive on this front.
? เข้าสู่ระบบติดต่อกัน Do Corporate Tax Cuts Really Pay For Themselves?